Whether Vinyasa, Ashtanga, or Bikram, yoga is a fantastic workout for building strength, boosting flexibility, and de-stressing. Like all forms of exercise, it helps improve blood circulation, and can even aid digestion – particularly dynamic stretching or twisting poses – both of which bring skin benefits aplenty. But there’s a lot more to getting the most out of your next yoga session than simply turning up. Ensure your skin looks as great as those asanas are making you feel, with MYSA’s tips for yoga skincare – and find out why a LUNA facial cleansing brush is skin-savvy yogis’ best friend! Athleisure beauty may be a thing… but we’re still big believers in exercising sans makeup. Why? It’s all because of your body’s amazing ability to thermoregulate: as you get warmer, sweat glands and pores open to cool the body down. But if your skin can’t breathe properly, pores become blocked, which can fast leading to breakouts. To get the most from that next yoga sesh and ensure your skin is also getting a proper workout, a pre-yoga class cleanse is a must. Quite simply, your body works better when it’s properly hydrated. Whatever form of yoga you practice, ensuring you’re properly hydrated before and during your session, as well as topping up after, is essential. That’s especially true for Bikram – or hot – yoga. 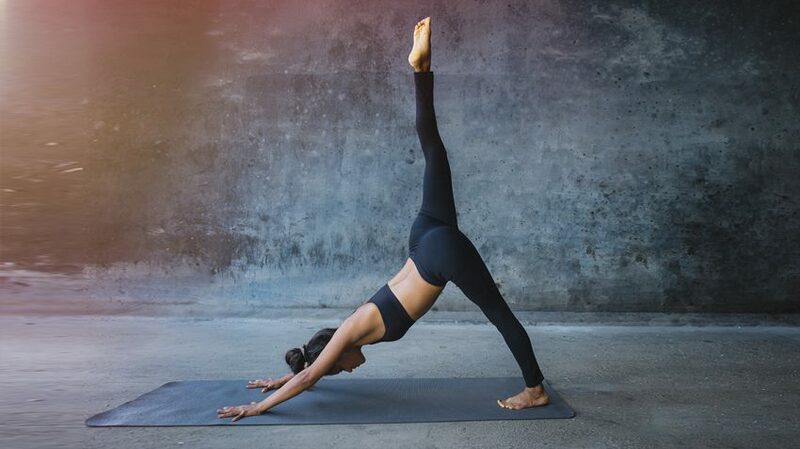 Because take it from us: 26 poses in a room hovering around 100°F makes you sweat… a LOT. But in addition to checking their water intake and electrolyte levels, yogis can also help lock in moisture and keep skin supple by applying a light moisturiser both before and after exercise. With the obvious and very sweaty exception of hot yoga, most yoga classes won’t make you sweat nearly as much as, say, a HIIT session or run. Nonetheless, a post-workout cleanse is essential – and here’s why. Yoga encourages your body to release toxins which when mixed with sweat, and in particular, makeup, creates a residue on the face that’s a playground for bacteria and breakouts. Leaving all that gunk and grime to dry on the surface of the skin is a recipe for disaster. Do your skin a favor, with a post-class cleanse with cool water to reduce redness and help your body cool down. And it goes without saying that for fans of Bikram or hot yoga, this step is essential – no excuses! Whether you’re borrowing it from the gym or using your own, yoga mats are a magnet for bacteria. 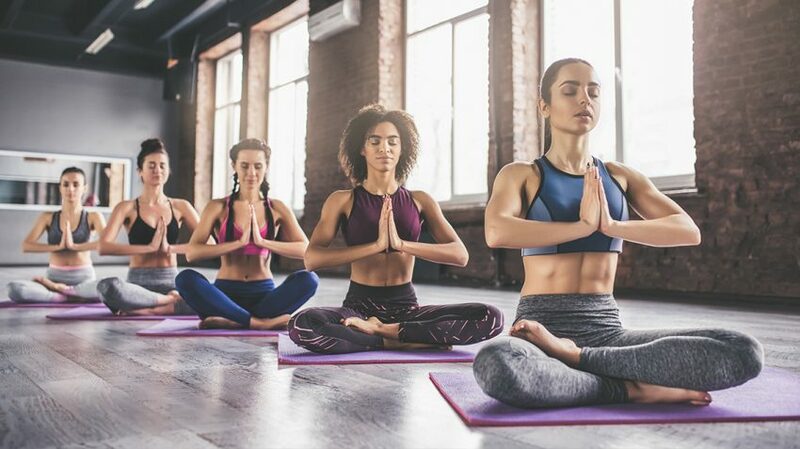 “The yoga mat is a very fertile source for infection, mainly because people sweat on them and they rarely are cleaned,” explains Dr. Robert Lahita, professor of medicine at Rutgers School of Medicine. Frankly, if that doesn’t convince you of the need for a post-class cleanse, we don’t know what will… To limit the transfer of bacteria nasties from your mat to your beautiful face, give them a regular wipedown with a disinfectant spray, invest in a yoga towel to place over the mat itself – and if you can, bring your own! Yoga brings so many layers of benefits. Sure, it’s great for building strength, improving coordination, and increasing flexibility, but the focus it demands – and particularly its emphasis on breathing – makes it a fantastic stress-buster. “Yoga helps us slow down for a moment and tune into the breath. Simply the focus on one thing – which is the very definition of meditation – allows us to decompress,” explains Dr. Terri Kennedy, yoga teacher and president of lifestyle and wellness coaching group, Power Living Enterprises. This is exactly why it can be so beneficial for the skin: tension and anxiety cause your body to release high levels of stress hormone, cortisol, which can increase the skin’s oil production. By keeping stress levels in check, you’re helping skin stay it’s healthiest best! The LUNA range of facial cleansing devices support yogis’ practice by keeping their skin in check – so you can concentrate on nailing those asanas! Because the brushes remove 99.5% of dirt and oil – including makeup residue – they’re ideal both for a pre-class cleanse, as well as that all-important post-workout washup to remove not just sweat, but also any bacteria nasties picked up from your yoga mat. Unlike traditional cleansing brushes, they’re made from soft, ultra-hygienic silicone which is gentle on the face and won’t cause irritation. The brushes have also been shown to improve absorption of skincare products – including moisturizer – helping skin lock in moisture and stay it’s hydrated, healthy best. A brilliant form of exercise for the mind, body, and soul, make sure your skin also gets the most from your next yoga workout. Namaste!